S'il vous plaît contacter d'abord pour un taux d'affranchissement précis à votre pays. Faites-moi savoir quels numéros d'article vous souhaitez acheter et aussi le pays dans lequel vous vivez. Je modifierai ensuite le montant d'affranchissement pour vous avant d'acheter. Póngase en contacto primero para obtener una tasa de franqueo exacta en su país. Déjame saber qué números de artículo estás interesado en comprar y también el país en el que vives. Luego cambiaré el monto del franqueo por ti antes de comprar. Kontaktieren Sie bitte zuerst für eine genaue Frankatur in Ihr Land. Lassen Sie mich wissen, welche Artikelnummern Sie kaufen möchten und auch das Land, in dem Sie wohnen. Ich werde dann den Portobetrag für Sie ändern, bevor Sie kaufen. CNPD - All 24 First Day Covers! One of them only had 17 made and many less than 30. Hence, full sets are just not seen often at all. Quite simply, DO NOT miss out! I wouldn't want to encourage debt, but this is just the sort of listing that Credit Cards were made for! I do not want to sell these on the cheap really, they are too special. The three Christmas ones (2005, 2006 and 2007) in particular are rarely seen in a condition like this, due to the mammoth Christmas post that occurs each year. 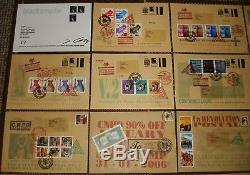 These are only printed on standard paper envelopes, so could be damaged very easily. Printed, published, stamped and posted by The Aquarium, Woburn Walk and The Aquarium L-13, Farringdon Road and L-13 Light Industrial Workshop, Clerkenwell, London (2004 - 2009). Condition of all: EXCELLENT as good as you will find on the whole - these were posted remember! 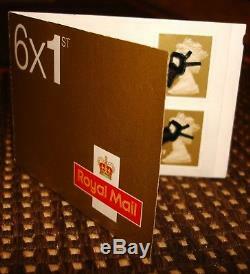 Size of all: 21cm x 15cm (Height x Width) - A5 Envelopes. Medium: Gummed glossed stamp paper on paper envelope. Previous Life: I painstakingly tracked these down over the years and bought them all on the secondary market, apart from one. None of them were addressed to me personally. Some of them have very special addresses! The Art Hate 2009 one I bought directly from L-13 in 2009.. All of the others I bought from other collectors between 2006 and 2008. The Art Hate FDC was not posted to people in the same way as the others and so does not feature an address on the front. All 25 have all been kept in their own plastic sleeve and kept together in a safe-box for a decade, away from light. A FULL BREAKDOWN OF THE FDC's - GOLD INFO!!! MAKE A NOTE OF IT! 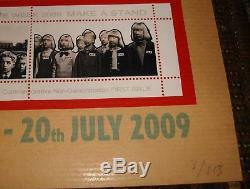 Blacksmoke Blackoff-E (Signed and numbered 62/200) 2004 200 made. Telecom Easter Special (CNPD) 01/10/2005 27 made and posted. Battle of Parliament Square Nu Con Com (CNPD) 01/10/2005 33 made and posted. N-CAP Road Safety Week (CNPD) 01/10/2005 23 made and posted. Something About God and Mobile Phones (CNPD) 01/10/2005 35 made and posted. 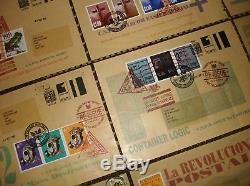 Container Logic (CNPD) 01/10/2005 17 made and posted. V2 SMD (CNPD) 01/10/2005 25 made and posted. 5-11 Guy Fawkes 400 Year Re-Issue (CNPD) 05/11/2005 73 made and posted. K-Foundation Award & Other Stuff (CNPD) 05/12/2005 85 made and posted. Christ They're Right Xmas 2005 (CNPD) 20/12/2005 96 made and posted. La Revolution Postal (CNPD) 28/02/2006 approx 100 made and posted. Occupation Day State Holiday (CNPD) 02/05/2006 approx 100 made and posted. FIFA World Cup Deutschland 11+45 (CNPD) 09/07/2006 approx 100 made and posted. Abbey Road Revisited (CNPD) 27/07/2006 approx 100 made and posted. Bad Car Bad Art (CNPD) 03/06/2006 approx 100 made and posted. Beckham Get's It (CNPD) 07/10/2006 approx 100 made and posted. 5-11 Guy Fawkes 401 Year Re-Issue - Final Solution (CNPD) 05/11/2006 approx 100 made and posted. 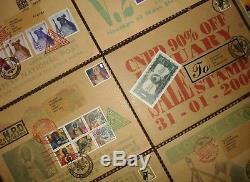 CNPD Counter Attack Slightly Better Stampage (CNPD) 25/12/2006 approx 100 made and posted. War Is Over WIO/1-0 (CNPD) 15/10/2007 approx 100 made and posted. Hark The Herald Angel Sings (CNPD) 25/12/2007 approx 100 made and posted. CNPD Last Post SMD 1st, 2nd and 3rd Class Queens (CNPD) July 2008 approx 100 made and posted. National Art Hate Week 2009 No. 3/113 L-13 13/07/2009 113 made. Where I have given approximate numbers, no actual figures were ever disclosed by The Aquarium. James Cauty has now been publishing works through the L-13 in it's three previous guises ('The Aquarium','The Aquarium L-13' and the'L-13 Light Industrial Workshop') for 15 years since the first Blacksmoke Stamps of Mass Destruction'Gas Mask Queen' pieces. His output over that time has been prolific, classy, quirky, dark, humorous, controversial, thought-provoking. And delightfully edgy and hard-hitting. Making him really like-able and collectable. The rarity of all of his work just amplifies this collectibility. There is always something for every budget with Jimmy's work too. His'Small World Re-enactments' are mind-blowing! Research his immense back-catalogue, you will be stunned by his imaginative productions. He and Bill Drummond have also recently re-joined artistic forces in releasing their JAMs project'2023 - What The Fook Is Going On? And carried out related promotional situationist shenanigans in Liverpool lol. These FDC's will be expertly packaged, very well bubble-wrapped and sent in a sturdy box, by door-to-door courier, fully insured and as quickly as possible. They will need signing for on arrival. I simply can't ask for more than that off you. A lot of my items go to the U. Never, ever had a problem of any kind, receiving or sending. I don't expect these to be around that long, so just grab them!! 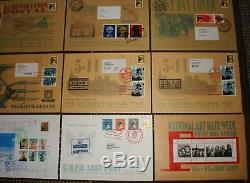 Please check out my other auctions for more Childish/Cauty/Reid/Adams/STOT21stCPlanB/L-13/ pieces... I have a lot of really nice items available for sale! That's a lot of paperwork! My love of Jimmy's work goes back to the 80's and my teen years. Victorya Penny Black' - Signed and Framed Pop Edition CNPD No. 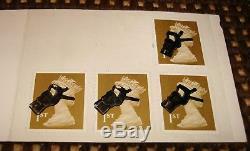 Stamps of Mass Destruction 1st, 2nd and 3rd Class' - No. 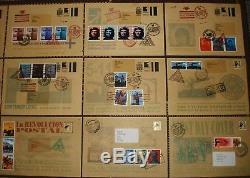 Best of British Serial Killers' - Mint Stamp Sheet No. 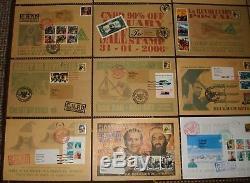 Set of 10 Mint Stamp Sheets inc.
1967 Arab-Israeli War' - CNPD Page Edition Print No. 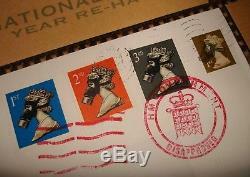 Set of 3 Mint Stamp Sheets inc. Terror Aware Queens Gold, Silver and Blue' - Page Edition CNPD No. CNPD Lying, Cheating, Stealing and the Death of Art Volume 1' - Binder and 7 Pages No. Believe The Magic - Operation Magic Kingdom' - CNPD Page Edition Print No. Dead Rat 1 and 2' - CNPD Page Edition Print No. Hammerheadz 2p' - Signed and Framed Mint Stamp Sheet No. Dead Dad 1' - CNPD Page Edition Print No. Stamps of Mass Destruction Volume 1' - CNPD Signed Book No. 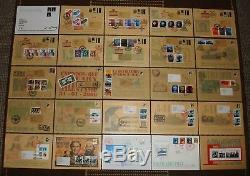 SMD 1st, 2nd, 3rd Class Stamp Book' - U.
CNPD SMD Volume 2' - Mint Stamp Sheet (Unfolded) as inc. In SMD & OPD Volume. 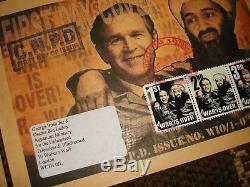 The item "James Cauty All 24 First Day Covers (FDC's) 2004 to 2009 SUPER RARE (L-13)" is in sale since Monday, December 17, 2018. This item is in the category "Art\Art Prints". The seller is "ad2020amsterdam" and is located in Workington.